Throngs of pilgrim bodies press tightly toward the temple, such that one wonders if breath is still possible. Autonomy disappears into a single amoeba flow. This is India, and the holy festival that gathers these thousands happens once in each lifetime; it makes of their many bodies a thrashing sea of devotion. But then, in the middle of the surging, the waters quietly part. A hush rolls over like a wave; a path opens around this moving silence. A sadhu, a holy man, is coming through. Several inches of metal protrude from his chest; as he passes by, the rest of the sword becomes visible plunging through his back. Calm and elevated, this itinerant half-naked holy man wanders on; no blood seeps from his wound, only the cleaving of his flesh cleaving the crowd. 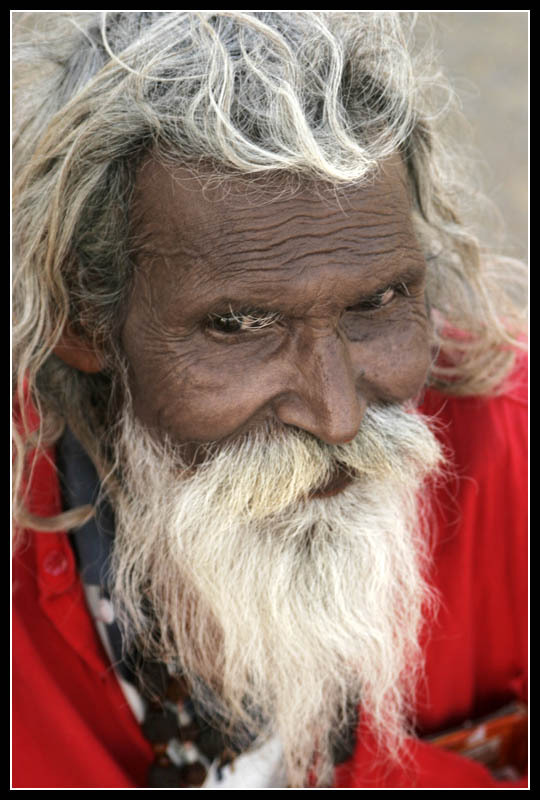 Another sadhu, further on, pulls a heavy ball and chain with a ring through his eyelid. Another is supine on a bed of sharp nails. Still another has not sat or lain for 14 years. * His body covered in dung and ashes, the sadhu seeks a final liberation from this flesh, finding a peace not of this world. I have returned to India, not as a pilgrim where sadhus roam, but on a pilgrimage, nevertheless. I’m seeking women at work with their spindles and looms, needles and threaded cotton, with their wild silk and vegetable dyes, busy making simple beauty of this complicated world. Women who drape themselves in color rather than ash, the scent of jasmine rather than dung. Women who tend to birth and death, and swaddle the whole of it with their hand-made grace. This, too, is India. Back at home, my father exercises a daily courage in remaining alive, as vividly as possible, in the gift of his body, even as it deletes its pleasures, grows heavy with each movement, or fires with the sharpness of pain. I’m convinced that staying every bit present to this earthbound life is a spiritual discipline at times as mighty as that of a sadhu, who yearns to transcend it. My father doesn’t need a bed of nails, a pierced eyelid. His day offers up its own ball and chain. What he needs, rather, is what I imagine that all of us need. We need to know what those women know, which is the grace of good work, the hand curving in love, the spell-binding, outrageous color of this world. And to feel it, every day, like a festival in our blood. And then, too, we need to know what the sadhus know, do we not? That we leave it all in ashes, and far too soon. That flesh will fail; that we all are one day lanced just there at the heart of everything we love. Cleaved open to know the whole of it, the hard-as-nails truth and the numinous; both. That we move on in silence, at last, like a wave on the ocean. And with a peace – here is my hope – of this world, and not. *These observations were made by Don Bloch, and recorded in his book, Seduced by the Beauty of the World. ~ by Susan on 02/18/2012. yes and yes. May your travels be tangled in wild silk, and more. Ah yes, it IS a festival. Since losing my breast and becoming acquainted with my new one, every breath I take, every stretch I make, every asana I hold has been a festival of gratefulness. Thanks for the metaphor and Godspeed.